Transport The Elmwood Hotel is situated in Bloomsbury just a few minutes walk from both Kings Cross station (rail and tube) and close to Euston station, right in the heart of London on the border between the West-End and the City. Situated just minutes from the hustle and bustle of the West End, 'Theatre land' and Oxford Street shopping yet in the immediate home place of The British Museum, British Library with "Peter Pan" and Charles Dickens House. By Rail: Kings Cross and St. Pancras stations. By Tube: Kings Cross. Air: Heathrow Airport 35 minutes by rail or car. 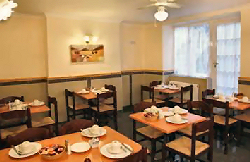 Description The Elmwood Hotel is a traditional bed and breakfast hotel suitable for holidaymakers and business travellers looking for a low-cost base for their visit. With many popular tourist attractions and transport links within easy reach, the Elmwood Hotel is ideal for those looking for centrally located, budget accommodation. 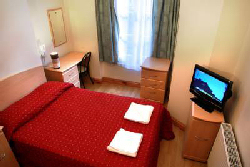 The Elmwood Hotel has 35 well decorated, clean and comfortable rooms rooms, all of which are furnished with amenities, including a colour television. 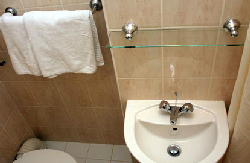 Rooms are available with private facilities. 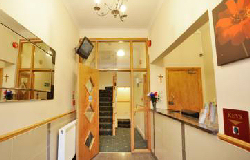 Friendly and courteous staff are available at reception around the clock. Rate are subject to availability and we will always book you the best available rate. No advance payment is required. You only pay the hotel when you are in London. Please note that the hotel charges 3.5% for credit card payments. No charge for debit cards and travellers cheques. Our Comments We warmly recommend this budget family hotel. 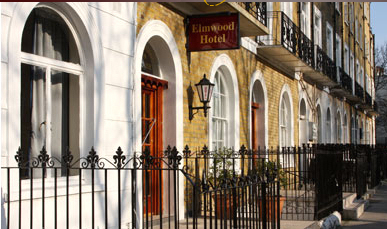 The Elmwood is a popular choice on our list of budget bed and breakfast hotels in central London.